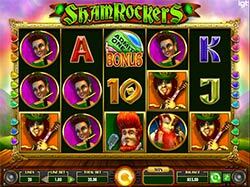 Shamrockers Slot Machine - Play Free Online at Slotorama! Rock out with the Irish in the ultra fun Shamrockers Slot: Eire to Rock, from IGT and available at Slotorama for free play. The emerald isle is known for its lush green grass, clovers, leprechauns and rainbows, but did you know there is a thriving rock scene there as well? And just like finding the end of the rainbow can come with a pot o' gold, so too can playing Shamrockers slot machine! Rock out with the Irish in the ultra fun Shamrockers Slot: Eire to Rock, from IGT and available at Slotorama for free play. The emerald isle is known for its lush green grass, clovers, leprechauns and rainbows, but did you know there is a thriving rock scene there as well? And just like finding the end of the rainbow can come with a pot o’ gold, so too can playing Shamrockers slot machine! In this game you’ll have a front row seat to watch the Shamrockers perform their live gigs. They’re a 4 member Irish rock band who love to get rowdy and when they hit the right chords, you could win some fantastic prizes. The stage is set against a rainbow sky with a lush green meadow surrounding it. On the reels you’ll find you’ll find each of the band members, an admission ticket, a clover, a golden VIP ticket, and card symbols 10 through ace. One fun part of this slot, apart from the graphics and cool music, are the great features that can amount to some hefty prizes for you! Shamrock Wilds – The Shamrock symbol is wild and substitutes for all symbols except the admission ticket bonus symbol to complete winning combinations when possible. Admission Ticket Bonus Symbols – When you get lucky and land three of these bonus scatter symbols anywhere on the center three reels you’ll trigger the Free Spins Bonus and win 4 Free spins with stacks of different major symbols on every spin. The stacked symbol on each of the four spins is predetermined and will resemble one of the four Shamrockers band members! Encore Feature – With the Encore Feature you can re-trigger the bonus if the golden VIP Encore ticket appears on the last spin of the bonus. The Bonus starts again with four free spins and repeats the cycle of stacked major symbols. This symbol only appears on reel 5!